Hasan Minhaj Breaks Through Dunk Fatigue With 'Patriot Act' The comic has a new news and current events comedy show on Netflix. There's no desk, no interviewing and no taped segments. There's just a guy off to a very good start. What is Dunk Fatigue? Well, let us take as a baseline that public life currently is full of people who are pretty easy to dunk on. And let us define "dunk" as a satisfying joke or barrage of jokes mixed with truths, cathartic and merciless, ostentatious and totally sincere, done in front of an audience eager to cheer. Any time you see a headline that says "[SO-AND-SO] DESTROYS [SUCH-AND-SUCH] OVER [TOPIC]," where said destruction takes place in a video you can watch that's just someone talking, that's probably a good old dunk. Minhaj's Patriot Act has, on the one hand, a host who is as good a dunker as anyone you will ever see. In his 2017 special Homecoming King, one of the best comedy hours Netflix has released during its time in the business, Minhaj tells a winding story about a girl he knew in high school. Quite unexpectedly, it involves, at one point, his recollection of a moment in which he dunked on this girl so beautifully, and so justly, that once he tells of it, and the audience roars, he has to run a victory lap of sorts across the stage, up and down risers, just to burn off the energy. If Minhaj, himself a Daily Show graduate, just wanted to dunk on people for a half-hour at a time, he could do it. It would probably keep people who like him happy for a while. But he doesn't. The show finds him not behind a desk but standing in front of a crowd, just like in stand-up. 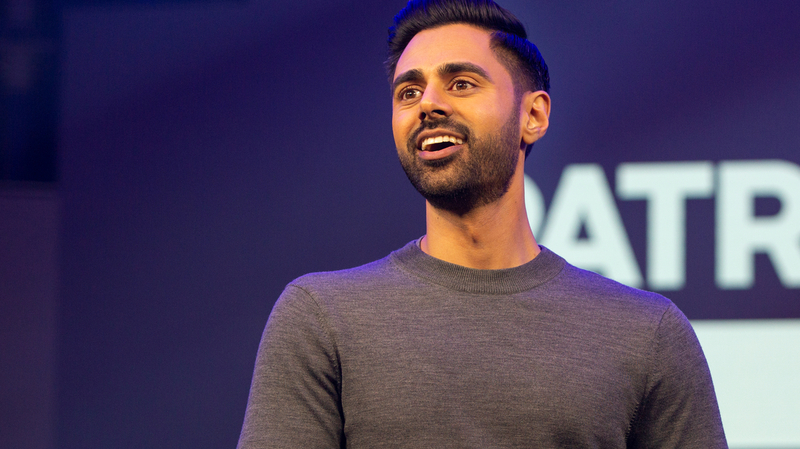 The show looks filmed rather than videotaped, and Minhaj simply addresses the crowd — yes, a little like a funny Ted Talk — and then the show is over. It could be nothing but great dunks. It just isn't. Consider this: In neither of the two episodes released on Sunday, each of which primarily covers one story, does Minhaj focus on the current most dunked-upon public figure we have: the president. While the administration figures in both of the central stories, it dominates neither. That may well change in the future, but for the moment, it demonstrates early that whatever he has to say about the president, Minhaj has a lot of other things on his mind that he wants to talk about. The first episode is about the current lawsuit against Harvard claiming that its affirmative action policy discriminates against Asian-American students. It's a complicated topic that Minhaj has a clear position on and a lot of convictions about. What winds up being most interesting, though, is his shifting focus. He does spend a good part of the segment talking about Ed Blum, a white man who has provided support for this lawsuit as well as others — a man the WNYC podcast More Perfect did an episode about in 2016. But Minhaj eventually broadens the scope to be not just about Blum, but about the thorny question of the involvement of Asian-Americans in the lawsuit and the entanglement of the interests of black families, the interests of other families of color, the interests of Blum and his ilk, and other questions. In other words: It's all well and good to make fun of one guy, but in the end, it's almost never all about one guy. Patriot Act feels a lot like Minhaj's comedy: So far, there are no taped pieces or correspondents. There is him, on a stage, walking around, with some visual aids projected behind him, quite like the setup of his comedy special. His arrival in this space feels emphatic, welcome and exciting. He is a charismatic, undeniably cool, young comic who talks about being Muslim, about being raised by immigrant parents, about racism he's faced and about what he thinks is right and wrong, in clear and sometimes startlingly earnest terms. He's a star; that's been clear at least since Homecoming King. But out of the gate, he's a star who has also decided to make a good show. Patriot Act is now streaming its first two episodes on Netflix. New episodes will be available on Sundays.